Mushrooms are one of my partner’s favourite foods, so I thought it’d be a nice treat to make a pot of cream of mushroom soup for us to take for our lunches one week. Mushrooms on the whole tend to be high FODMAP, but oyster mushrooms are delightfully low FODMAP in servings of less than 75g per person, so they’re ideal for using in this recipe for cream of mushroom soup. As this soup was intended as a treat for my partner I used lactose-free double cream in it, but if you’re intolerant to dairy or allergic to it you can use a non-dairy cream instead. In fact, I’ve made this again since I developed this recipe and I used Oatly oat-based cream in it and it was just as delicious. 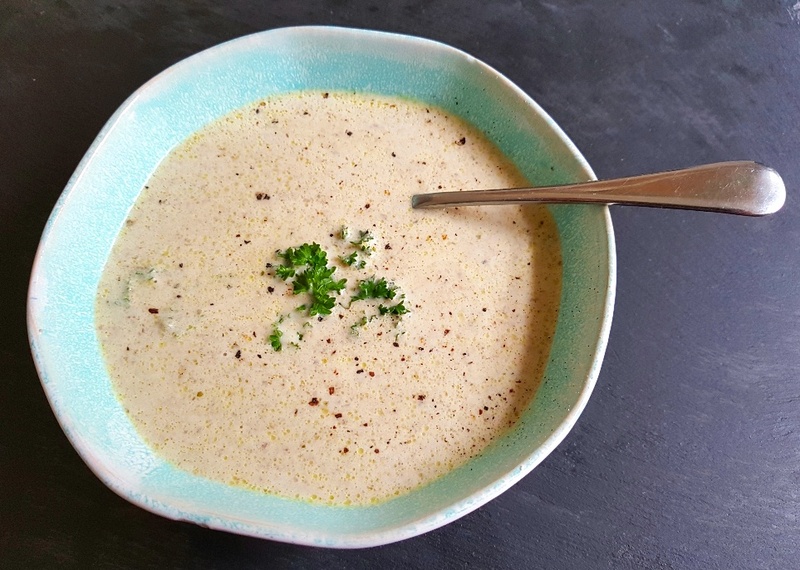 This cream of mushroom soup is quite thin as opposed to many of the thick soups I tend to make, but I think it’s no less for it because it’s extremely flavoursome and rich. I also quite like the fact that because it’s so thin you can drink it straight out of a cup without seeming uncouth! If you’re a mushroom lover who’s looking for a simple, but very tasty soup to make in next to no time at all then this is the one for you. Dissolve the stock into the boiling water. Put a saucepan over a medium heat and add the mushrooms, thyme and stock. Bring to the boil and simmer for 5-10 minutes until the mushrooms are soft. Remove from the heat and add the double cream and stir. Blend the soup until smooth and then serve.